While I have had my fair share of consoles, both home and handheld, through the years, I have always found myself predominantly drawn to my PCs as gaming platforms. From my first computer, with a 486SX running at 25MHz, a basic VGA graphics card and 8MB of RAM, to my current computer with an overclocked Core i5-4690K, an AMD Radeon R9 290 GPU and 16GB of RAM, each of my desktops has been used heavily for playing video games, even when they were not particularly suited to the games of the time. Something I’ve noticed throughout the progression of PC specifications over the last fifteen or so years is that PCs have steadily become more compelling options against the dedicated video game consoles of their time. While, when I got my first computer in 1996, you could specify a computer that could outstrip the consoles of the time, it came at a considerably higher price and took considerably more effort to get games going on than the plug-and-play consoles like the PlayStation. Meanwhile, my PC with its standard VGA graphics card was more akin to the previous generation of consoles like the SNES in terms of graphical capability. In 2016, not only does my current computer, which isn’t even on the pinnacle of PC graphics performance, far outstrip both the Sony PlayStation 4 and Microsoft Xbox One, it is possible in the United States to specify a computer that beats both consoles in graphical capability, yet costs in the same region as them (well, OK, that’s if you don’t want a Windows OS). This PC would also, despite the low price, have flexibility and adaptability unbeknownst to the consoles including the ability to use it for general-purpose computing and tens of thousands of commercial games available in just about every genre under the sun. At the same time, the current generation of consoles have been losing some of the traditional advantages of console platforms, such as the loss of split-screen multiplayer allowing multiple players to compete using a single console and a single screen, as well as the plug-and-play advantages of being able to put a disc or cartridge straight into the console and start playing being eroded by the necessity for multi-gigabyte bug-fixing patches. Despite the improvements to the PC platform which have made it possible to easily specify a computer that will easily beat the consoles as well as have the capacity to do things other than video gaming and media consumption, PCs are still lumbered with a reputation from their past from when they genuinely were expensive, temperamental and difficult to set up. Furthermore, certain game developers, allured by the easy money of the console market, have allowed these misconceptions to be treated as gospel by their customers, focusing their games on the consoles and then follow up with lazy ports to the PC which fail to take advantage of the superior graphical potential of the platform and which frequently feature control schemas and user interfaces that assume that players are using console-style control pads. The period between 1981 and 1982 represents a turning point in the history of personal computers. Commercially viable computers had been first put on sale in 1977 in the United States, but none, even the long-lasting Apple ][, would have the market impact of the IBM PC, which would later form the standard for the modern personal computer, the Commodore 64, which would become the best-selling computer model of all time and the Sinclair ZX Spectrum, which represented one of the few platforms that stood against the Commodore 64 toe-to-toe and managed to hold its own. Each of these computers was created in a turbulent market where dozens of manufacturers worldwide were already jostling for position and each computer managed to not only survive but thrive as many other models of computer dropped off the radar in later years. The IBM PC was the first step into the personal computer market from the company that was then the largest computer company in the world, but it was then irrelevant to the gaming market – and will be discussed in passing in this section. On the other hand, both Commodore and Sinclair had precedent in the PC market, both having had previous sales successes. Commodore had been one of the pioneers of personal computing in 1977 with their PET 2001 computer, which competed with the Apple ][ and Atari 400/800, then followed it up with the first million-selling computer in the VIC-20 in 1980. Sinclair’s first releases, the ZX80 in 1980 followed up by the ZX81 in 1981, were even by the standards of the time very limited, with a scant 1KB of RAM by default, but with release prices of £99.95 and £69.95 on release respectively, they represented an affordable entryway into hobbyist computing. The Commodore 64 and 48K Sinclair ZX Spectrum: Two of the fiercest competitors in the 8-bit home computer market. A notable characteristic about both the Commodore 64 and the ZX Spectrum was that both computers were particularly inexpensive. The Commodore 64 was released at a price of $595, which compared very well with the Apple ][+ at $1,330, the Atari 800 at $899.95 and the entry-level IBM PC at $1,265. Yet it was surprisingly sophisticated, with the 64 KB of RAM from which it got its name compared to 16 or 32 KB in most contemporaries, a very sophisticated graphics chip which was better than almost anything else on the market and arguably the best sound chip of any 8-bit computer in the MOS Technologies SID, with three voices capable of generating four different waveforms and each with their own ADSR (attack decay sustain release) envelope to further modify the output of each voice. Its only notable weakness was a comparatively slow processor, a MOS 6510 at 1.023 MHz (or 0.985 MHz in PAL regions) which might have matched the Apple ][ range, but did not compare well to the 1.78 MHz processor in the Atari 8-bit computers. The ZX Spectrum was not as sophisticated, with less sophisticated graphics hardware that lacked the hardware sprites and had a more limited colour palette compared to the Commodore 64 and a simple one-channel beeper which was significantly more limited than the SID on the Commodore machine. On the other hand, on release, it was significantly cheaper at £125 (approximately $220 in 1982) for the 16 KB model and £175 (approximately $310) for the 48 KB model. Both computers would soon become even cheaper with Commodore engaging in a price war against its competitors in the United States which led to the Commodore 64 dropping to $200 by 1983 and Sinclair decreasing prices on the Spectrum in response. The low price of both computers is significant in the economic context of the time. The economic recession of the 1980s had a greater effect on Europe than it did on the likes of the United States and Japan and hit the United Kingdom especially hard, the country having experienced a string of crises throughout the 1970s. In particular, the conversion rate of the pound sterling dropped significantly in the period from 1980 to 1985, from an average of $2.33 in 1980 to $1.29 in 1985. While adoption of computers was slow between 1982 and 1983, with an estimated 600,000 microcomputers in the UK by the end of 1983, sales picked up significantly by 1984, by which time the economy of the UK would dictate that less expensive computers were most likely to succeed. There were similar situations across Western Europe and as other countries in Europe lacked a strong indigenous home computer market, consumers in these markets were inclined to buy American or British models. The low price of the Commodore 64 is also significant – and has been linked as a cause – for an event in the video game market which had a huge impact in the United States, but had little effect in other markets. The North American video game crash of 1983 has become legendary, as the glut of consoles in the market at the time succumbed to the arrogance of the marketing executives pushing such systems, who seemed to believe that customers would eat up whatever shovelware the game developers could push out and come back for more, ultimately while the rapid decrease in price of the Commodore 64 made it a compelling alternative. As unsold copies of the overproduced E.T. The Extra-Terrestrial for the Atari 2600 were being buried in a landfill in New Mexico, causing a contraction in the video game market in North America that would last until the 1985 release of the Nintendo Entertainment System, if you were in Europe, you would be forgiven for not realising that the crash had happened at all. 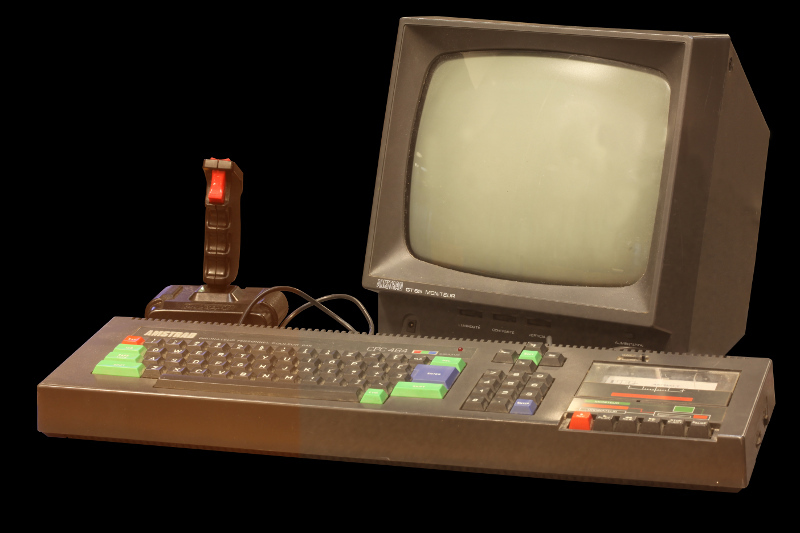 The games market in Europe was already based around personal computers, most notably the Commodore 64 and ZX Spectrum, but also including several other predominantly British home computers such as the Acorn-designed BBC Micro, the Dragon 32/64 systems from Dragon Data and the Oric systems from Tangerine Computer Systems. The NES wouldn’t be released in Europe until 1986 and not in the UK until 1987, by which time the personal computer market had well-and-truly taken hold. Even by 1983, games like Manic Miner and Chuckie Egg, which would become known as some of the best games available on 8-bit platforms (and, incidentally, which would exemplify the “one man programming in his bedroom” sensibilities of the European game development sphere), had already been released – and things were only just getting started. The home computer market picked up significantly in the UK in 1984, as more than one million home computers were sold, more than doubling the number of PCs in the country. Exposure of the home computer was helped by the BBC’s Computer Literacy Project and television shows like The Computer Programme and Micro Live. For the former, the BBC had put their name to the BBC Micro, an expensive, yet sophisticated computer designed and produced by Acorn Computers. While at a release price of £400 in 1981 (approximately $2,000), the top-of-the-line 32 KB BBC Micro Model B was too expensive for most households at the time, it did find its way into many schools and later sold a respectable 1.5 million units over its history. The BBC Micro is not just significant for its role in the BBC’s efforts in trying to spread computer literacy, however, as it also plays a large role in computer gaming history. In 1984, a pair of students at the University of Cambridge, David Braben and Ian Bell, would work together to release the seminal game Elite, creating a legacy that lives to this day. Elite is one of the earliest sandbox games, a space simulator in which the player is given the freedom to play the game in any of a multitude of ways and in which there is no true victory condition. This contrasted heavily with the general pattern of games of the era, which were still generally simple, arcade-style affairs. Yet, despite this, Elite was very successful, soon spreading from the BBC Micro and similar game-focused Acorn Electron to be ported on platforms ranging from the Commodore 64 and Spectrum to the Apple II to the Japanese MSX range, even to the Taiwanese Tatung Einstein and then to the next generation of home computers in the mid-1980s. 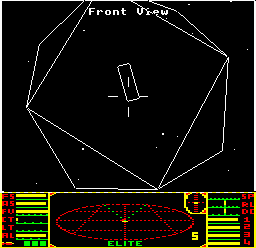 Elite on the BBC Micro: Wireframe 3D graphics and a universe to explore on less than 32 KB of memory. Elite was arguably the most sophisticated game of its time and, being designed for a home computer with more memory than consoles would have until the Sega Mega Drive in 1988, was very much a PC-focused game. While it was eventually ported to a console – the NES – in 1991, this required additional hardware and memory mappers to make up for the limitations of the console. In any case, until that point, if you wanted to play Elite, you needed a PC of some sort. While discussing the efforts of British coders during this period, I do not intend to ignore the fact that American development studios were also developing sophisticated games for home computers at the time, including the Ultima series of role-playing games from Richard Garriott and while the ZX Spectrum design only reached America in the form of the largely incompatible Timex Sinclair 2068, the Commodore 64 was also wildly popular in the United States. However, few of the American games became a sales success in the UK or the rest of Europe for various reasons, largely linked again to the economic downturn in Europe. While European audiences predominantly bought their software on cassette tapes, which had excruciatingly long loading times even by the standards of the day, but were cheap and could use a standard cassette player which was likely already in the home, American games were written for floppy disks, which granted greater capacities as a consequence of not having to load the whole game into memory at once and significantly improved the loading time for software, but were more expensive and required the purchase of an additional floppy drive on top of the base package. On the other hand, not scared off from the games industry by the collapse of the predominant game market like the Americans, the European coders felt free to exploit their home computers to the limits. Several elements made the home computers much more friendly for hobbyist coders to make the step to commercial game development, including the use of rewritable media like cassettes and floppy disks rather than the cartridges of consoles (although several home computers did have capacity for cartridge-based games). As a result, a huge number of one-man projects were started and had the capacity to become commercially viable. This did, predictably, lead to a lot of dross mixed in with the good games, but it created a crucible for innovation and diversity which would rarely be seen in the industry. 1985 saw the Western release of two systems that would, in the coming years, very much illustrate the differences between the American and European game markets. The Commodore Amiga 1000 was the most sophisticated home computer of its time and while that model itself would not become particularly successful, successor machines such as the Amiga 500 would find far much more success in Europe than they would in the United States from which they came. On the other hand, the Nintendo Entertainment System, derived from the Japanese Famicom (or Family Computer), would be seen as the saviour of the games industry in the United States but was far less successful in Europe. In the meantime, though, the 8-bit home computers had a lot more to offer… and the Germans had not yet illustrated their best. Part 2 of this series will discuss the years leading up to 1990, which represented a golden age for the home computer in Europe, but where complacency, bad business decisions and the growing threat of the IBM PC would soon after cause the demise of the supremacy of the personal computer for several years afterwards.